U.S. President Donald Trump pats U.N. Secretary General Antonio Guterres (L) on the arm as they attend a session on reforming the United Nations at U.N. Headquarters in New York, U.S., September 18, 2017. UNITED NATIONS - U.S. President Donald Trump criticized the United Nations for bloated bureaucracy and mismanagement on his first visit on Monday to U.N. headquarters, calling for “truly bold reforms” so it could be a greater force for world peace. Ahead of his maiden speech to the annual U.N. General Assembly on Tuesday, Trump hosted a short event to boost support for changes to the United Nations. 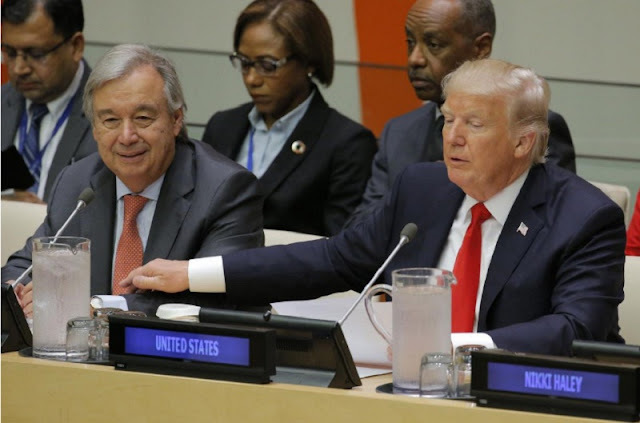 “In recent years the United Nations has not reached its full potential because of bureaucracy and mismanagement, while the United Nations on a regular budget has increased by 140 percent and its staff has more than doubled since 2000,” Trump said. “The United Nations must hold every level of management accountable, protect whistleblowers and focus on results rather than on process,” Trump said. “I am confident that if we work together and champion truly bold reforms the United Nations will emerge as a stronger, more effective, more just and greater force for peace and harmony in the world,” Trump said in his first remarks at the U.N. in New York since his inauguration as president in January. Businessman Trump, who complained during his 2016 election campaign about the United States paying a disproportionate amount of money to the United Nations, made the point again on Monday. The United States is the biggest U.N. contributor, providing 22 percent of its $5.4 billion biennial core budget and 28.5 percent of its $7.3 billion peacekeeping budget. The contributions are agreed on by the 193-member General Assembly. He agreed that U.N bureaucracy was a problem that kept him up at night. The United States is reviewing each of the U.N. peacekeeping missions as annual mandates come up for Security Council renewal in a bid to cut costs. The United States is a veto-wielding council member, along with Britain, France, Russia and China. On Sunday night, U.S. Secretary of State Rex Tillerson met with U.N. High Commissioner for Refugees Filippo Grandi. “U.S. aid is vital to what we do to support refugees around the world and to find solutions to their situations,” Grandi said. U.S. President Donald Trump criticized the United Nations for bloated bureaucracy and mismanagement on his first visit on Monday to U.N. headquarters, calling for “truly bold reforms” so it could be a greater force for world peace.